Santana Row has come a long way in the past 15 years. It is now an internationally recognized destination that has become a model for mixed used projects everywhere. 700 Santana Row is the last major development project to complete the original vision for the street. Future building will likely go across Winchester, where Federal Realty is planning a near 1 million SQFT office project at the former site of the Century dome theaters. 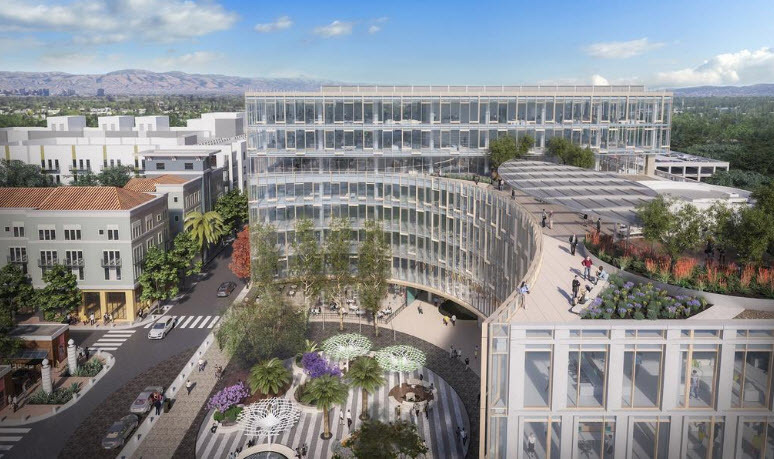 Splunk, which already has a massive amount of space at Santana Row, has agreed to take on another 300,000 SQFT at the new building. This will bring their total presence to 535,000 SQFT and put the bulk of the company in San Jose as opposed to SF. The capstone building at the end of Santana Row will be ready for full occupancy by 2019, but the first 3 floors will be in use this October while the rest of the building is still under construction. The project will also add 1,300 new parking spaces and 30,000 SQFT of retail.